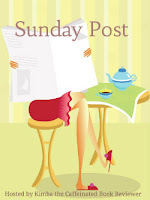 Sunday Post hosted by Kimba the Caffeinated Book Reviewer /Stacking the Shelves hosted by the team at Tynga's Reviews / Showcase Sunday hosted by Vicky at Books, Biscuits, and Tea . . .
Borrowed from a friend . . .
Sunday's Weekly Book Recap #22 was originally published by Catherine for bookclublibrarian.com. This post cannot be republished without attribution.